I like place cards, do you? Elegantly scripted or whimsically illustrated, they add charm tot he table and a sense of occasion. Next dinner party, why don’t you try this? A friend of ours threw a birthday dinner for her husband. He is fond of wearing bowties. That’s my place card above. Each of us had one, nicely and inexpensively framed, beckoning us to our seats. Which, given the amount of scotch consumed, was a very good idea. They were beacons in the haze. 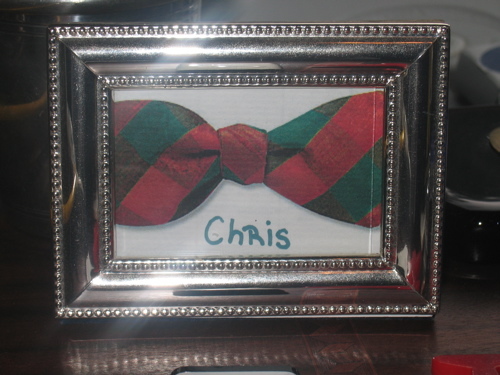 The hostess couldn’t really draw or paint, so she found pictures of a bunch of different bowties on the internet, printed them out and framed them in Indian silver frames purchased at the Dollar Store. Perfect. If you can sketch or watercolour, so much the better! Easy and elegant. My kind of detail. This entry was posted in Entertaining, Uncategorized and tagged place cards. Bookmark the permalink. 5 Responses to Framed: Places Everyone! We always do placecards for special dinners, but let the creative nieces do them. We’ve had beautiful autumn leaves with the names in silver or gold ink, funny little beaded angels holding namecards, tiny pumpkins with names in black sharpie… it elevates the occasion. What a great idea! I just had a dinner and wished I had place cards. This would have been perfect. How clever! Although I love to set a table and use the lovely pieces I’ve collected over the years, I rarely use place cards and don’t own full sets of place card holders. However, I do own pairs of these in several different styles and I use them on buffet or table to display the menu. Most of our entertaining is for intimate groups and both my husband and I choose not to tell people where to sit. I don’t know why – but I do find it a bit intimidating to seat people. There have been a number of occasions where I have formally seated our guests. In those instances I’ve used fold over cards. Your hostesses bow ties were just a lovely, personal touch. Mrs. Toad and I were at a wedding last weekend, and they did just this very thing, with one exception. Each frame was personalized with something germaine to each guest. It was a lovely touch. So simple. But, who would have thought of it? Quite nice, and I’ll be copying this idea. Thanks for sharing.